Commonly called a Morton’s neuroma, this problem begins when the outer coating of a nerve in your foot thickens. As this tissue thickens inflammation occurs and painful symptoms develop. Neuromas are generally benign -they are not cancers.These usually occur on the ball of the foot, generally between the third and fourth toes. 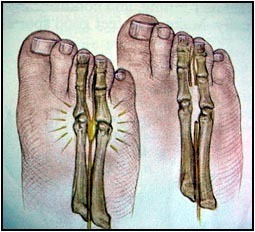 The area between the second and third toes is another common neuroma site. Some nerve problems due to diabetes or alcoholism many also cause neuorma-like symptoms. The pain from neuromas may start gradually, causing burning, tingling, cramping, or numbness. Symptoms often occur after you’ve been walking or standing for a period of time. It might feel like you’re stepping on a lamp cord.. In some cases, the pain radiates from the base of the toes to the tips of the toes--patients often complain of numbness affecting a toe.The pain may be aggravated by various shoe types, and sometimes removing the shoe and massaging the area affords the patient some temporary relief. The painful symptoms are often on and off, that is with exacerbations and remissions. However, with time, the symptoms become more persistent. Neuromas can be treated in various ways, including injections of anti-inflammation medication, the use of orthotics to control abnormal mechanics, and if the condition is chronic, surgery is often times employed to remove the growth and to afford the patient resolution of their symptoms.This surgery is generally an outpatient procedure. In the last few years, Dr. Marcus and others has utilized a sclerosing technique utilizing an alcohol- based solution to shrink the nerve growth. Throughout the country foot and ankle surgeons are finding this method advantageous. Dr. Marcus has found that this conservative approach to be quite effective. However if conservative methods are not sufficient then surgical intervention is qute effective to resolve the pain.